Rule-Based Turkish Text Summarizer (RB-TTS), BIRANT, C. C., AKTAS, O. Fault Ride Through Capability Enhancement of a Large-Scale PMSG Wind System with Bridge Type Fault Current Limiters, ALAM, M. S., ABIDO, M. A. Y. Hybrid Solution for Privacy-Preserving Access Control for Healthcare Data, SMITHAMOL, M. B., RAJESWARI, S.
A Novel Approach for Bi-Level Segmentation of Tuberculosis Bacilli Based on Meta-Heuristic Algorithms, AYAS, S., DOGAN, H., GEDIKLI, E., EKINCI, M.
Novel TPPO Based Maximum Power Point Method for Photovoltaic System, ABBASI, M. A., ZIA, M. F.
LUCANU, N. , PLETEA, I. V. , BOGDAN, I. , BAUDRAND, H.
The paper presents an application of the Wave Concept Iterative Process (WCIP) in the case of the study of the scattering of an electromagnetic plane wave by two metallic 2D obstacles. 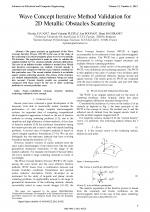 The application is made in order to validate the original method for two classical metallic obstacles diffraction. The case of an infinite circular cylinder is treated first. Modal and iterative convergences are studied. Current density is calculated and compared with the exact solution available for this particular case. The second studied obstacle is an infinite square section scattering obstacle. The 4 faces of the structure are studied independently, mutual influence being not taken into account. Current density results are presented and compared with those issued by the use of other scattering methods for several particular cases. T. K. Sarkar, E. Arvas, "On a class of Finite Step Iterative Methods (Conjugate Directions) for the Solution of an Operator Equation Arising in Electromagnetics" IEEE Transactions on Antennas and Propagation, vol.33, No.9, pp. 1058-1066, October 1985. K. K. Mei and J. G. Van Bladel, "Scattering by perfectly-conducting rectangular cylinders," IEEE Trans. Antennas Propagations, vol. AP-11, pp. 185 - 192, March 1963. R. Kastner, R. Mittra, "A Spectral-Iteration Technique for Analysing Scattering from Arbitrary Bodies, Part I: Cylindrical Scatterers with E-Wave Incidence", IEEE Transactions on Antennas and Propagation, Vol. 31, No. 3, pp. 499-506, May1983. Z. Baharav, Y. Leviatan, "Impedance Matrix Compresion Using Adaptively Constructed Basis Functions", IEEE Transactions on Antenna Propagation, Vol. 44, No. 9, pp. 1231-1238, 1996. 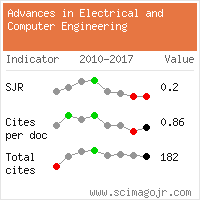 Citations for references updated on 2019-04-22 12:02 in 136 seconds.